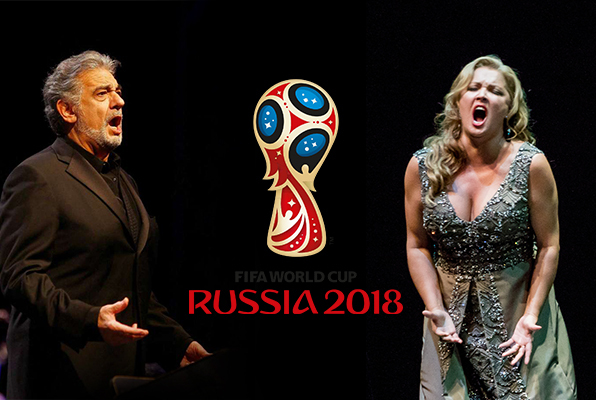 Tenor Plácido Domingo sang the official song for the FIFA World Cup when Spain hosted the event in 1982. Luciano Pavarotti’s performance of "Nessun Dorma" (Puccini's Turandot) at the 2006 Winter Olympics in Turin, Italy marked the tenor's last public performance before his death in September 2007. Canadian soprano Measha Brueggergosman serenaded the home team when she sang the Olympic hymn at the 2010 Winter Olympics in Vancouver. This one made history - on February 2, 2014, soprano Renée Fleming became the first opera singer (male or female) to perform the American national anthem at the Super Bowl! Talk about a homecoming treat. Soprano Anna Netrebko performed the Olympic Hymn when the 2014 Winter Olympics were held in her native Russia. main photo credit: Plácido Domingo by Aris Messinis, Anna Netrebko by Vladimir Kervorkov.